Amazon recently tested a marketing program called 100 books for under $3.99. This is for Kindle books only. The test program went so well that they decided to make it a regular feature. Hey, everyone likes a good deal. So when my distributor asked me a few weeks ago if I wanted to participate I said yes. My distributor told me that there was no guarantee that my book would be selected. After all, there are close to a half million books available on the Kindle and they can only feature 100 of them at a time. But it was worth the shot. 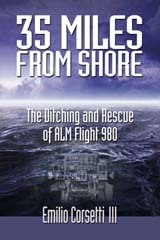 My book 35 Miles From Shore made the list for October. How big of a deal is this? Before this special promotion my book had respectable sales with an average sales ranking ranging around 20,000 to 30,000. On October 1, the very first day of the promotion, my sales ranking got as low as 555. The lower your sales ranking number the better. No book can be successful if no one knows about it. When it comes to books, there is no one better at book promotion than Amazon. When the Amazon machine gets behind your book you have a powerful ally. Throw in a low price of just $2.99 and you have all the ingredients for success. So thank you Amazon. And if you want to read a really good book for less than the cost of your average magazine, just visit my Amazon Kindle book page.